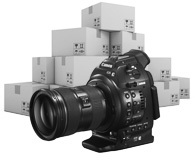 Our range of cameras features everything from handheld DSLRs right up to full studio set ups.. If you’re a budding photographer/ filmmaker or want to take your production to the next level, ProAV has everything you need to get fully up and running. Take the time to choose the right camera for your needs and do some research on the different brands until you find the one that suits you best. Of course, you won’t want to forget all your accessories as well. Camera straps, cases and lenses are all the essentials that you’ll want to get started with, but once you’re all ready, you might want to invest in some other add-ons. Audio equipment, lighting and storage devices will all come in handy and take your camera work from amateur to complete pro. If you can’t find what you’re looking for, or you just want to get some more information, give us a call on 01442 292929 or use the Live Help button to speak to someone online - we’ll be happy to help you out and answer any questions.